We are absolutely, positively in love. We all are! She is lovely! And so is her name! She's simply beautiful!! Love, love, LOVE her name!!!!! Oh, my! What a precious, beautiful gift! I am so happy for you! Pure sweetness….Congratulations on your new blessing! Oh, she is BEAUTIFUL! And I love the name. Can't wait until you have your girls! Oh, what a beauty! I love her name! She is absolutely an Esther! Congratulations! So sweet! She is a beautiful baby girl. She is Beautiful. My daughter is from Hunan. We adopted her last year. I wonder if they were at the same orphanage at the same time. Gasp! Her name is beautiful!! Congrats1 She is so precious! Shes a real cutie! Love the middle name you choose! That little mouth is just precious! Wondering how you are pronouncing the middle name. Such a classic name. Love it! She is wonderful! Congratulations and God Bless you for your perseverance. Prayers for continued strength to stay the course-she and Poppy are worth it, of course! She's absolutely beautiful and I love her name! God Bless your whole family! I LOVE the name! Great choice and she is beautiful! Love her name!! We also have a Hunan beauty that is now 3 1/2. She is from Yueyang City. Oh I can see how you felt compelled to carry her sweet face around with you. What a blessing! Congratulations to you all! We have a Hunan baby as well, from Huaihua City! She's so cute!! Congratulatons! Simply gorgeous!! Congrats Stefanie to you and your family!! She is absolutely beautiful!! God is good! So excited to see pictures of your sweet Esther!She is a real beauty!! Can't wait to see both girls in your arms. What blessings and what an amazing story!! God is so awesome!! Beautiful name and a beautiful girl. We are so thrilled for your family! Keeping you all in our prayers. Perfect name for a beautiful little girl! She's lovely! I love her name too. Can't wait to see those two little sweeties together! Congratulations! I l-o-v-e the name:)! Beautiful name for your beautiful daughter! Congratulations!!!! Pixie dust is glowing all around this little cherub for sure!! She's such a DOLL!! Love your middle name pick too. She is simply precious, precious, precious!! ..Now let's get this darling home and see some smiles and belly laughs!! She looks sooo sweet with her pouty mouth and tiny hand up with a half wave. I know you can't wait to hold her! God Bless you and your family. What a beauty she is!!!! Congratulations!!! Beautiful girl. Beautiful name. Congratulations on this precious blessing from the Lord! Oh my ~she is sooo beautiful ! Perfect little bitty, perfect name!!! 🙂 Blessings and love! OH My is she an Esther! Her whole name fits her perfectly. I am just praising God for ALL He has done! He is truly amazing! Esther is a doll! I can't wait to see her in your arms! Way to keep Adaline in your back pocket! 🙂 Great name! She is "absolutely, positively" GORGEOUS! LOVE her beautiful name… it suits her perfectly!! oh my wow – she's gorgeous! and you picked such a perfect name for such a perfect little soul. Congrats to your fam!! Oh my! I love her name!! Perfect! She is beautiful!! They look like sisters…and your daughters. 🙂 God is so good. Congratulations. She's beautiful as is her name. She's beautiful and the name is perfect! I love her little mouth! Our Avery has a mouth like that one :). Blessings for speedy travel! WOW! She is beautiful! Esther and Poppy are going to make quite the pair! Congratulations! Congratulations! 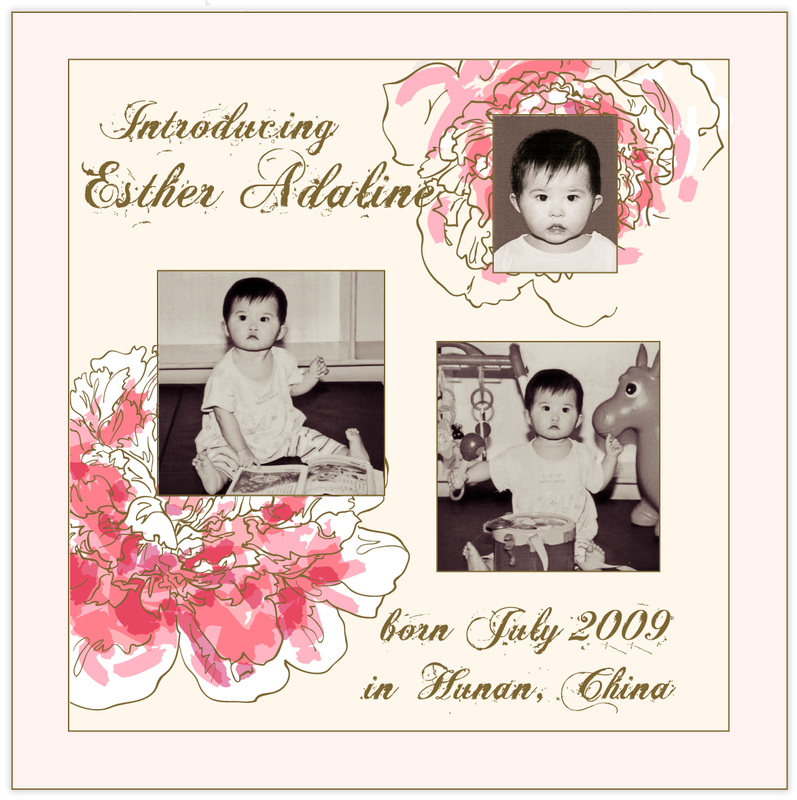 Esther Adaline is beautiful! Oh, Steph! She's beautiful!!!! Her name is positively gorgeous!!! I just got goosebumps all over!!!! YAY!!! Love Love Love the name:) She is beautiful – Congrats! So so so beautiful and precious!! I am so glad we finally get to see this beautiful face. And indeed she is definitely an ESTER!! And you could not have picked a more beautiful middle name as well. What a treasure to go with all your other treasures!! What a Wonderful Mighty God we serve! Now we are just praying them both home!! Those two together are gonna light up your world even more! Hugs! Have always loved the name Adaline, no matter how it's pronounced. One of my mom's friends from Bible school was named Adeline (pronounced Adda Line) and had this glamorous, ladylike Southern drawl. I was enamored as a kid. And darn. I just love love love the name Phoebe – I noticed it on your other list. NO ONE in my family will even give it the time of day for our next mei mei. Grrr. OHH.. She is beautiful!! Congratulations! I love the name! So precious! Yea!!! Congratulations to you. She is so ADORABLE!!!! Is she beautiful, or what?!? So exciting! Hope you get to travel soon! Wishing you a much less treacherous road from here on out, to bring her and Poppy home! Is it pronounced Adalyn? Or Adaline? As in Madeleine? 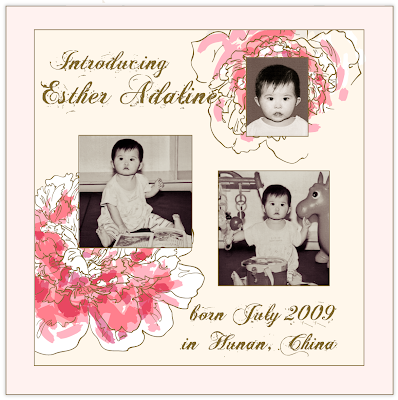 Your new precious Esther Adaline is beautiful, just like her name and sister Poppy! Can't wait to here you have your TAs for your girls! Thank you for sharing your journey with us again! Awesome- I HAVE GOOSE BUMPS! Love the name! We are hoping to name our next lady bug after my husband's aunt Esther who was the sweetest lady ever. Both your precious baby and her precious name. So can't wait to follow your journey to bring these two sweet babes home!!! A-dorable!! And I love, love the name!! Perfect! I love her name!!! It’s perfect!!! She is so beautiful…. She does take your breath away! You know she and Ruby have the same birthday!!! Wow – a blog lift to go with the new youngen – great work!! As for the name – absolutely LOVE IT – reminds me of when I used to sing barbershop!! And as for you daughter – there really aren’t words for it – darling, precious, beautiful – they don’t even come close so …. Steph – how old is she in these pictures? She looks a lot like Mo at a young age. This name just rolls off the tongue – love Adaline. ANOTHER absolutely GORGEOUS addition to the family! Congrats to each and EVERY one of you!!!!! God is so stinking COOL! She is beautiful … and so is her name! She is just presious no wonder you carryed her picture around with you Congrats! Blog looks gorgeous!! Esther is a love!! Absolutely adore her name and am so happy for your family. Blessings as God does yet two more miracles bringing your precious babies home. We will be praying for your family and following every step 🙂 Thank you for sharing your joy, it helps me believe that God may have a miracle for our family too! A beautiful name for a beautiful little girl! Her name is beautiful and she is just divine! Congratulations.